Well, how about some sock news? SealSkinz, the company that obsesses about wet weather protection and moisture management, announces a breakthrough in waterproof sock technology that benefits users in both outdoor and cycling markets. 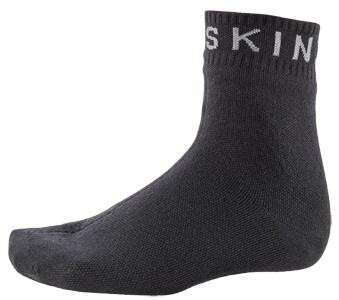 SealSkinz new, super thin socks are 33 percent lighter than its thin waterproof socks. Thinner is better with socks in road shoes, at least, and SealSkinz attributes the breakthrough to an eco-friendly bamboo inner layer, new outer yarns, and an improved knitting pattern. It’s been fun to put these new socks into the hands of buyers and see how surprised they are when I tell them that they still come with our lifetime guarantee and are 100% waterproof and breathable. Said Brendan Collins, SealSkinz USA’s national accounts manager. There are four styles of Super Thin Sock, encompassing two lengths and two levels of performance. They are the Super Thin Ankle (MSRP $32), Super Thin Mid (MSRP $35), the Super Thin Pro Ankle with Hydrostop (MSRP $45) and the Super Thin Pro Mid sock with Hydrostop (MRSP $50). 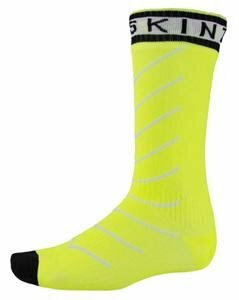 The Super Think socks will begin shipping to specialty outdoor and cycling retailers in Q1 of 2018. I don’t wanna think about the rain right now, after 8 months of it in Seattle, but this looks like a solid product. And, some welcome non-political news.